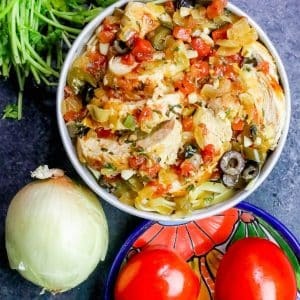 Super quick and easy one pot Creamy Tuscan Chicken Gnocchi Recipe is a one pot delicious easy dinner everyone loves – from fridge to freezer in less than 25 minutes! 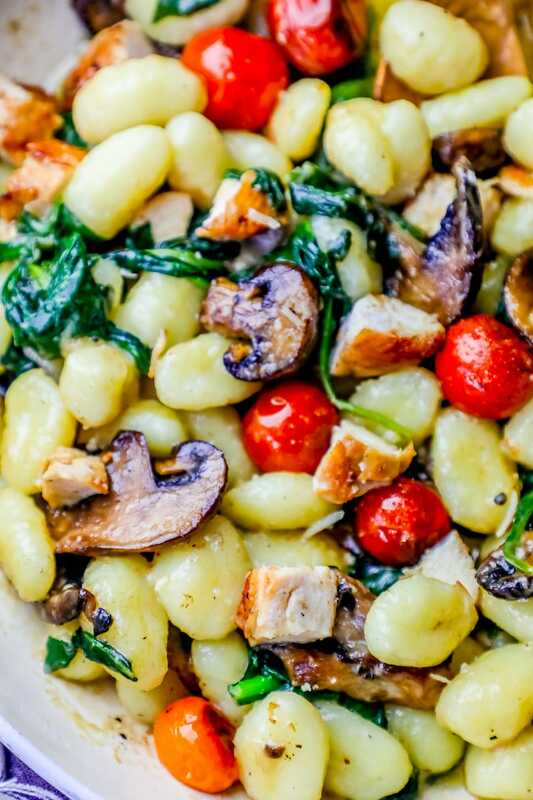 This creamy chicken gnocchi is bursting with garlic, tomato, mushroom, spinach, and chicken flavor for a hearty chicken gnocchi dinner you’ll want to eat again and again! 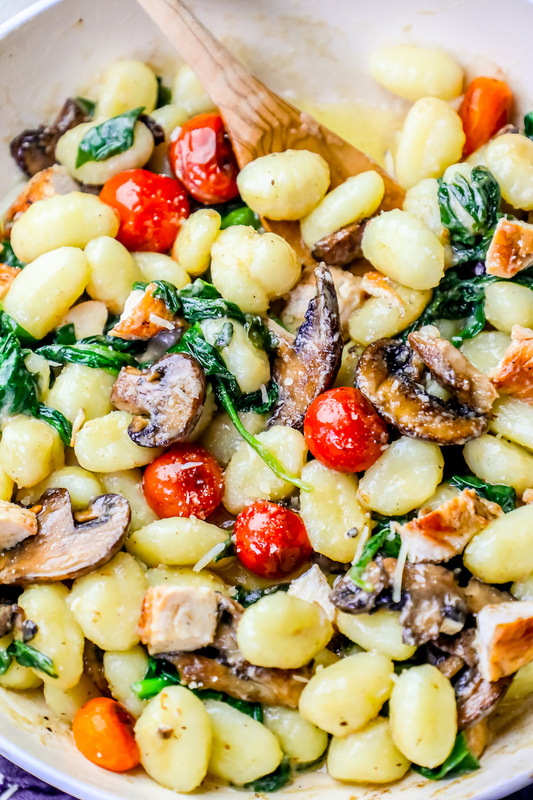 This creamy Tuscan parmesan gnocchi recipe is super easy – but there are a couple tried and true tools that will make it the easiest dish, ever! Follow my amazon affiliate links (I get a small commission at absolutely no cost to you which helps me offset the costs involved in running Sweet C’s) for my favorite picks! 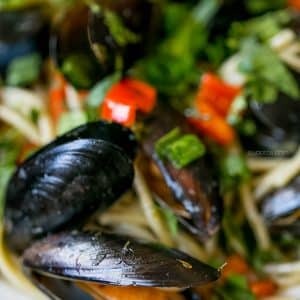 -Grated parmesan is fine in this recipe, but I prefer to grate my own parmesano reggiano fresh over my gnocchi – it is salty, nutty, and so delicious! -Wooden spoon or non-metal spatula. 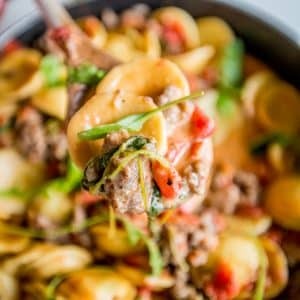 -I prefer to buy super soft fresh gnocchi from my grocer’s deli refrigerator – it is faster and easier to cook than the dried variety in the pasta aisle. 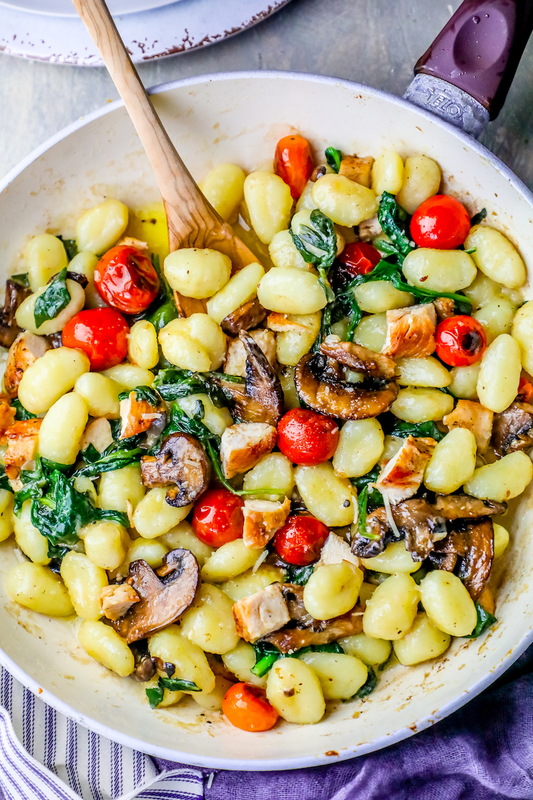 If you’re cooking gnocchi in one pot, the refrigerated fresh kind is best. 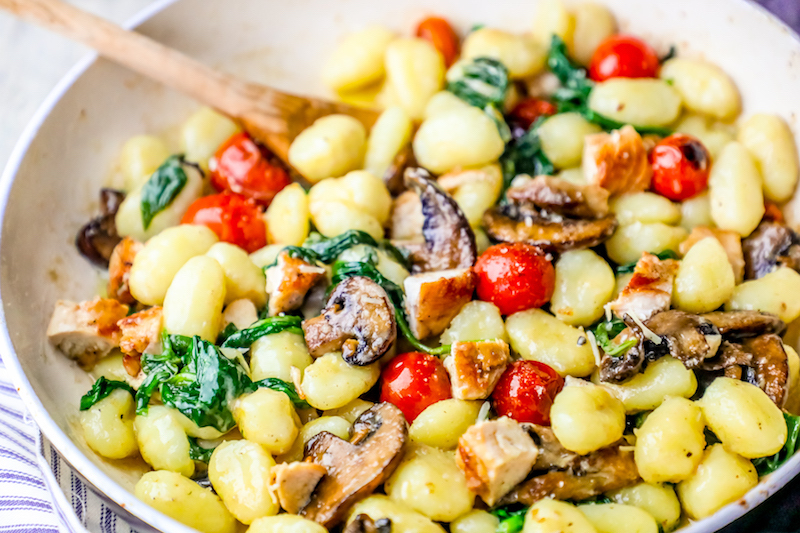 -Cook the gnocchi in the same pot. -Turn heat off when adding cream. 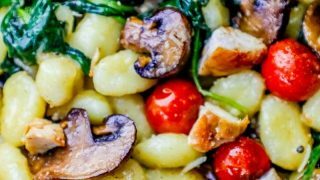 If you love this Creamy Tuscan Chicken Gnocchi Recipe as much as I do, please write a five star review, and be sure to help me share on facebook and pinterest! 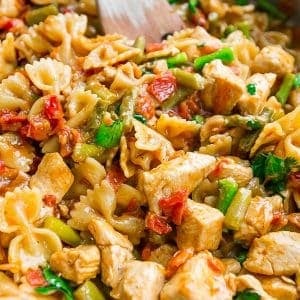 Super quick and easy one pot Creamy Tuscan Chicken Gnocchi Recipe is a one pot delicious easy dinner everyone loves - from fridge to freezer in less than 25 minutes! 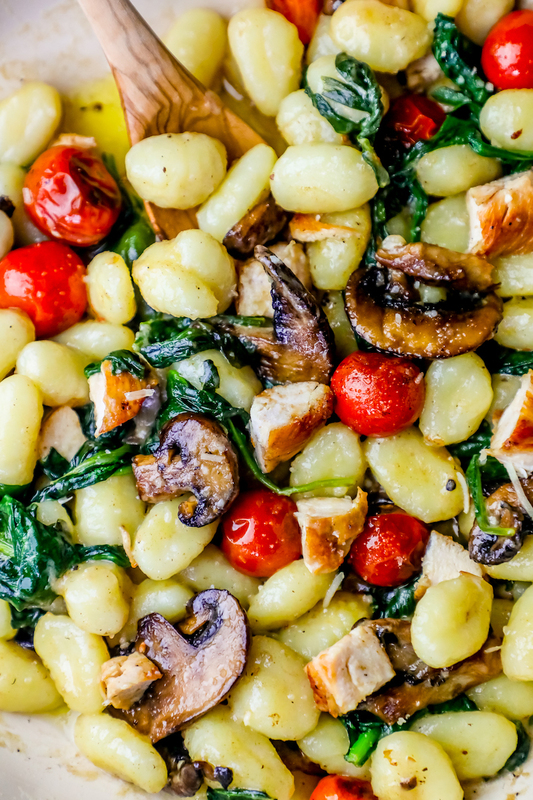 This creamy chicken gnocchi is bursting with garlic, tomato, mushroom, spinach, and chicken flavor for a hearty chicken gnocchi dinner you'll want to eat again and again! 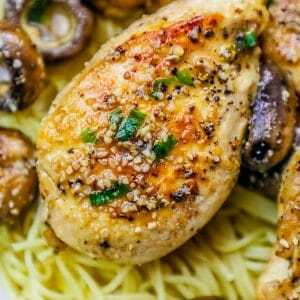 Add chicken to pan, and cook, stirring occasionally to prevent burning, until golden brown. 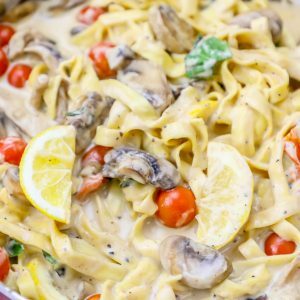 Add tomatoes, garlic and mushrooms, cook until garlic is fragrant and soft and mushrooms have started to brown, about 3 minutes.